Habitat: Horsetail is native to the Northern hemisphere. It can be found on grassland, waste lands and roadsides. Description: Horsetail is a shrubby, annual or perennial plant. Two kinds of stems appear from the creeping rhizome: sterile and fertile. Fertile stems are erect, hollow, leafless and unbranched. They bear a cone-like catkin. Sterile stems are taller and bushier. They appear during summer, from July to September, with small and brown, scaly leaves. They give off numerous branches in whorls. Useful components: Silicic acid, calcium, phytosterol, beta-sitosterol, malic acid, vitamin C, volatile oil, potassium, salts. 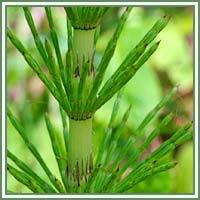 Medicinal use: Horsetail has antimicrobial, antiseptic, anti-inflammatory and diuretic properties. The plant is very useful in treatment of kidney, bladder problems, prostate and urinary infections and bleedings. It is usually prescribed in cases of blood in the stool and urine. It can help in case of uric acid kidney stones by increasing the urine output. It is an excellent agent in removing toxins from our body, and can help healing bladder infections. 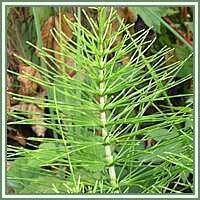 Horsetail is also very useful in treatment of bronchitis, pneumonia, nosebleeds, excessive menstrual bleeding, and bleeding wounds in general. Due to silica and calcium compounds, Horsetail can be very effective in cases of sprains, fractures and rheumatoid arthritis, and can be used both internally and externally. Safety: Do not use Horsetail if you are pregnant and are breastfeeding, have heart or kidney disorders. It is advisable to consult your doctor/herbalist before consumption of Horsetail.